So, quick (like rippin’ off a band-aid) recap . . . So much for Blake’s sub-THREE ERA vs. the Rangers . . .
} the bright spot of the entire game was the middle relief of Dominic (who posted TWO scoreless innings and gave up only ONE hit and struck out TWO) followed by Joe (who recorded a scoreless inning of his own). not that the bats could seem to do anything to overcome even a TWO-run deficit but, giving up another THREE was certainly not going to improve the situation. Once again, as their extra-base hits (or LACK of) go, so go the M’s . . .
McClendon said this was the first time this season felt disappointed in his team's approach at the plate. That dbl play, 6-4-3 was magical. Andrus watching it on big screen. Couldn't believe it. Good luck on the transfer off the knee on that one! g90 | eleven on the wrong side tonight . . .
It’s not often that the M’s hitters score EIGHT runs on THIRTEEN hits including FIVE for extra bases and the M’s pitchers strike out TWELVE . . . and lose. But, it happened tonight, since those same pitchers also allowed FIVE homeruns and THREE doubles. Now, who replaced my Safeco with Coors?!? Kuma has been on a slide of late, coming into this game, he had given up FOUR earned runs in each of his last FOUR starts. Sure was hoping this would be where he turned things around ~ alas, several days after being named to his first All Star Game ~ he puts up his worst start of the season and sees his ERA rise to 2.97 (from 1.79 where it was just FIVE games ago) . . . I wasn’t at the game but, a dear friend was and she sent me this lovely pic . . . 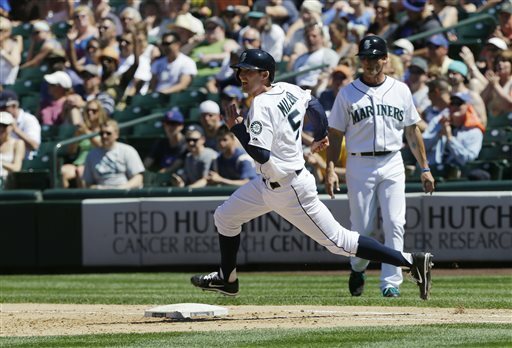 In five games hitting leadoff, Brad Miller has a .368 average and .454 OBP, with two doubles and two triples. That'll work. With hit number 1688 as a DH, David Ortiz has just tied Harold Baines for the most hits by a DH. g82 | I thought the Cubbies were supposed to stink . . . Between catching up on errands and chores that went neglected yesterday in favor of social engagements and loss of cable and internet for awhile this afternoon, I was unable to see any of the game, though listened to as much as possible. ‘t was pretty bleak early, pretty exciting late and pretty disappointing in the end, though, not without bright spots on which I will try to focus. Jeremy’s M’s debut back in early June left much to be desired, as he gave up SEVEN earned runs and was unable to get out of the 5th. Since then, he’s had FOUR total starts and gone at least 5+ in each (once a full EIGHT) and given up a total of FOUR earned runs. Today, the Cubs definitely had his number, as he wasn’t even able to get out of the FOURTH . . .
} Enter long-man, Blake. He allowed an inherited runner to score and then ONE of his own but, settled down and pitched pretty well . . .
} Oh sO good to see Tommy mow ’em down! first batter took awhile to get (9 pitches till the fly out) but then a quick ground out and a strikeout swinging. Let’s just get the bad outta the way . . .
Now then, the good . . . The bad news ~ so much for “Safeco Joe” . . . The more or less expected news ~ Blake with decent mop up duty . . . The good news ~ with a 1-7 deficit, Tom got a chance for his “soft-landing” . . .
Back to bad news ~ Carter continues to have long-ball-itis . . .
Taijuan Walker tosses 6.0 shutout innings in Triple-A debut as #Rainiers tally 1-0 win over Fresno. Kuma was playing with fire early on, as the A’s had a runner at 3B in each of the first THREE innings (including via a triple – the first Kuma had allowed all season) but failed to score. Unfortunately, the bullpen ended up with an even worse day . . .
} Blake replaced Kuma and got through the 7th without giving up any runs despite two singles but, the 8th would not be so kind. Back-to-back homers and back-to-back singles extended the A’s lead to 6-2 – still with only ONE out. * SUPER diving web gem by Nick in the 8th for the out of what would have been a sure single, maybe more. 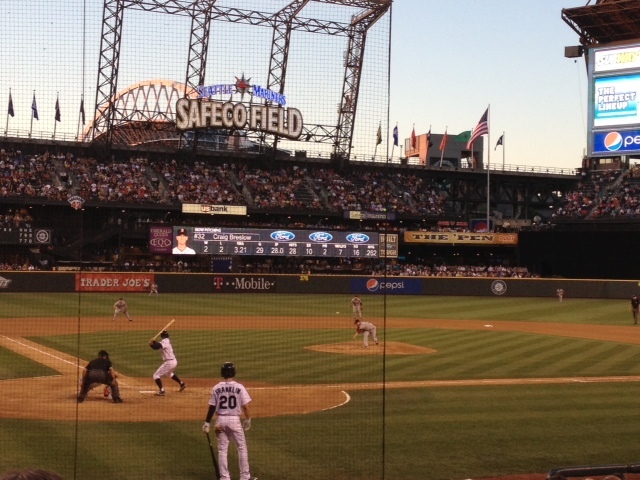 That fourth Oakland run ends streak of 8 consecutive quality starts by #Mariners pitching. g61 | words not typically uttered . . . thank heaven for Blake Beavan! Aaron Harang’s night in Seattle against the Yankees wasn’t quite as bad as Phil Hughes’ outing in New York against the Mariners (when he gave up 7 runs and didn’t get out of the 1st inning). In fact, things were looking manageable after the first TWO innings – a hit batsman the only base runner. Then came the 3rd and the melt-down ensued . . . FIVE singles, ONE double, TWO homers and SIX runs later, Aaron was out of the game. Enter Blake Beavan, fresh back from Tacoma. I was worried that things weren’t going to get any better with this switch (in fact, part of me thought it might get worse). Was I glad to be wrong. Blake came in and not only ate innings (to save that depleted bullpen) but MOWED ’em down – retiring NINETEEN of the TWENTY batters he faced (and got the double play immediately after the single). His performance really can’t be over-stated. They needed an outing like that because it helped in the immediate (resting a totally depleted bullpen) as well as provided some encouragement for the future, should Harang and Bonderman continue to struggle (whether it be as a long man or as the mop up dude. In any case, when was the last time a “reliever” posted a line like this? Combine players who played SIXTEEN innings the day before and a pitcher who is “on his stick” and it’s not typically an easy day at the office. Phil Hughes was the total opposite of what the guys saw in NY in May. the only managed FOUR total hits (THREE off Hughes) and only ONE extra base hit (a Kyle Seager’s RBI double in the 8th). Very excited to be a Seattle Mariner! Definitely got put in the best organization I could have. Feel blessed and excited to be a mariner! Dustin Peterson, brother of Mariner first-round pick DJ Peterson, just got picked No. 50 overall by the Padres — right after the M's. ::: Yes ~ I got my Brendan Ryan “I talk to buffaloes” tee shirt. ::: No ~ my night at the ballpark wasn’t very pleasant. Obviously, the loss had a lot to do with the unpleasant-ness but, it actually started before the game. I decided to have what has been one of my favorite food items at The Safe: a beef crepe. Normally, my indulgences of the fare of La Creperie have been fresh, hot, tender and delicious. Last night it was more stale, barely warm, chewy and over done 😦 I thought about complaining but, didn’t have the energy so, I just ate it at standing at the bar overlooking the bull pen as I watched fans trickling in . . . sincerely wondering if they might have some of the 5000 tee shirts leftover. I made my way up to the 300 level, got some hot chocolate (because it was freezing!) and then went to my seat in the first row of section 340. I was actually supposed to be in 341, third seat in but, decided to take my chances with the end seat across the aisle. That was the best decision I made all night. Once a few others arrived, I soon realized I would have been just two seats away from a very vocal Orioles fan (it was bad enough being across the aisle – all I could think of is at least I’m not right next to him). Anyhoo, he wasn’t really obnoxious or anything, just cheered for his team but, it’s just SO iritating when the M’s are losing and you are close to opposing fans – especially when the stadium is . . . much less than full (oh, btw, all the shirts were given away – attendance was 13k+). As for the game itself . . . I picked this game to attend because I hadn’t yet seen Brandon pitch in person and it seemed (from the way things had been going) he had the best chance at a victory. Well, so much for that theory – the lead-off homer he allowed was foreshadowing of a bad night much like my stale, chewy crepe . . . The somewhat encouraging thing is, all four runs were given up in the first inning and he went on to toss three scoreless. Granted, he had to work REALLY hard to get through those three innings but, hard as it is to take the loss, he’ll be better for the experience, likely learning a lot from it. And the ‘pen . . .
Blake was no better that Aaron, Ollie walked a couple but didn’t allow a run and Medina actually posted a nice 1.1 outing. The Mariners are 1-for-19 with the bases loaded this season. Ouch.